A life-size photograph shows young girls between the ages of 11 and 13. Their hands are tinted red and brown with beautiful henna designs. They are dressed in elegant robes, their faces are coloured with immaculate make-up and they are carrying bouquets of vibrant flowers. You would think this was a photograph of flower girls at a wedding. Rather, it shows these children on their wedding day in Yemen. Nujoud Ali is seen in Sana’a, Yemen, Feb. 2, 2010. She was married to her husband, more than 20 years her senior, when she was only eight years old. Photo from Stephanie Sinclair – tooyoungtowed.org. This is the first photo in Stephanie Sinclair’s collection of 30 documentary photographs on the subject of child marriage. Too Young to Wed is being presented as part of the French Canadian section of Amnesty International’s campaign, My Body, My Rights. The exhibition is on display at the Gesù in Montreal until Sept 29. My Body, My Rights is an Amnesty International campaign focusing on the respect of sexual and reproductive rights. “We thought child marriage was a good example of violation so that’s [why] we chose to focus on this issue,” said Colette Lelièvre, campaign coordinator of the French Canadian section of Amnesty International. 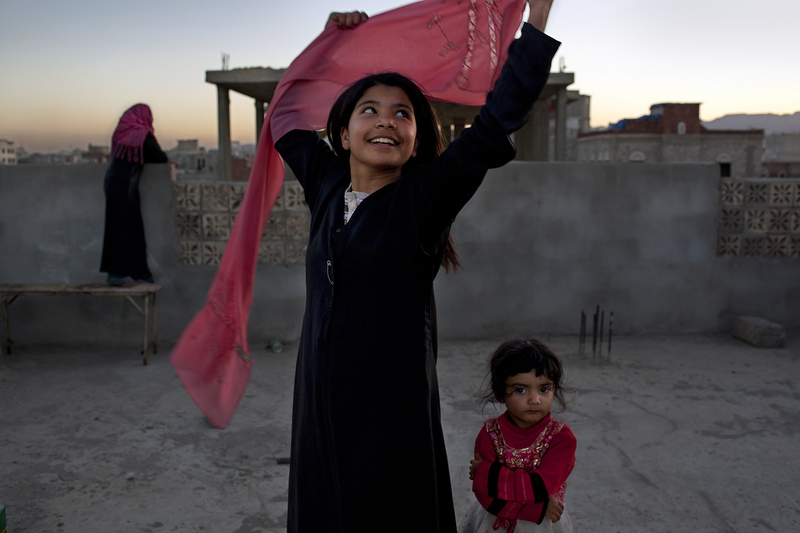 The photographs detail the lives of child brides in Yemen, Afghanistan, Ethiopia, Nepal and India, countries deeply afflicted by the practice of child marriage. Images are accompanied by quotations from political leaders, the girls themselves, as well as information explaining more about the harmful traditional practice and its consequences. Two photographs featuring 11-year-old Ghulam from Afghanistan are particularly striking. One shows Ghulam playing in fresh green fields in her village on the day of her engagement. Dressed in a bright pink dress, she smiles. She looks free and innocent. Directly beside this photograph she sits with Faiz, her 40-year-old husband to be. In contrast to her soft and playful gaze in the other photograph, her face turns hard and her sharp eyes glare darkly at Faiz. On the other hand, Faiz looks directly into the camera, seeming completely natural and content. The exhibition is not completely dismal. Sinclair includes a few glimpses of hope and solutions that come from within the countries on display. For instance, a photograph of Ethiopian youth shows their preparation and anticipation for a traditional dance performance. Amnesty International hopes to use public support to lobby world leaders to take a stronger stance on protecting sexual and reproductive rights. 2014 will see a review of the Programme of Action adopted at the International Conference on Population and Development in 1994, the first program to detail these rights.